Here's a bit of south east London modern folklore - The Bexley Gnome Cult. It was brought to my attention by Dave, who reads my blog. 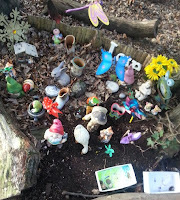 He sent me some photos and messaged me, saying: "The Bexley Gnome Cult has been running most of this century. At the moment it's a bit bedraggled, but it's maintained regularly. It sometimes reminds me of Latin American voodoo altars Something for the psychogeographers?" "Firstly let me say that the Bexley Gnome Cult and the rival Crayford Church of Dagon are purely my embroidery on some actual observations of mine. Old Bexley is first mentioned in C8th Anglo-Saxon records. It lies on the edge of the London conurbation - if you turn right at my gate it leads to the 200-year-old cricket club and beyond that to rolling Kent countryside and the ancient Joydens Wood with its Neolithic flint mines and Saxon earth works and further still the remains of Cadwallon's City. Unlike most parts of London, about half of the people were born, grew up and often work in the area, the rest being deracinated incomers like myself. My other half thinks that Old Bexley is twinned with Twin Peaks. "Bexley Park Woods are allegedly ancient (though I also heard that they were clear felled in WW1) and known for the parakeets and bats. There are one or two oddities - there is a plaque attached to a tree, in memorial to members of the local scout troop who fell in WW1. A pine tree is decorated each Christmas. 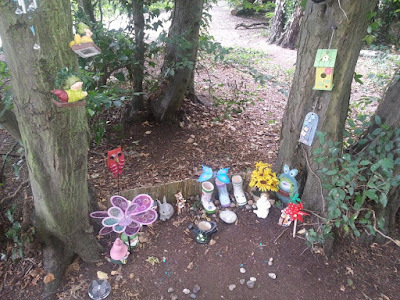 "I first came across what I call the Gnome Sanctuary in 2003, not long after moving here. It comprises two trees by a footpath, with groups of gnomes, dolls, small statues at the foot, each surrounded by a small enclosure. Later an enclosure of the entire area was added. Windchimes and ornaments are hung from the trees and sometimes signs are added to the trees. Last year, what I think are Buddhist prayer flags were added. It is clearly maintained and altered from time to time. A couple of times, some mean spirited scrote has kicked everything over, but both times it was restored, with a message to the perpetrator attached to the tree. "I've not idea who put them there. As a coordinator in the Bexley Stasi, I could probably make enquiries. Realistically, it's probably children from the nearby houses. I prefer theories about primordial cults. I make hints that I wouldn't go there after dark. Whatever it is, it's a work in progress." If you have spotted any modern folklore in your area, do send me a picture and any details you know. Well that's a turn up for the books. I wonder if Jack Gale knows more about it. I will certainly be paying it a visit. Thanks for sharing it Lucya. Hello, I used to live next to Bexley Woods, and I am sure that this collection of gnomes was started as a shrine to a child that passed away. 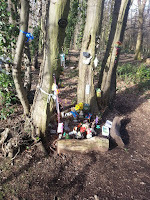 I have heard that it was local children and their parents who kept it going, but I am sure they are much older now, so it looks like the Gnome Shrine captured people's imaginations and hearts and the Gnomes have kept going. There was an eco survey done for these woods, which turned up some very interesting things, it is an ancient woods, as it has been a woods for over 500 years, the age of the trees are not what they date ancient woods by, but if you look around the perimeter of the woods, you will find troughs called Deer Banks, which stopped the Deer from wandering away, when almost the whole of the Bexley area was a Deer park and covered in woods. The Eco Survey manager said he could tell that these banks were at least 200 years old from the size of the Oaks growing out of them. There is also a WW2 Bunker buried in these woods, you can find the concrete roof, it held up to 500 people, and you can speak to some of the elderly walkers who remember playing in them before they were filled. The Eco survey were excited to find a very rare species of ancient native woodland plant, I think I remember it was called Cow Wheat, the council put some logs around it to try to stop trampling. A Bat survey was also done on these woods, and they were very excited to find that out of the 8 species of bats found in London, 6 species use these woods, including the rare large brown bat, which there were signs of down by the river, near the riverdale road entrance. There have also been Stag Beetles at these woods, which the Eco Survey team were very interested in, as they have little record of Stag Beetles in the South East of London. The Eco Survey team couldn't believe that they had never heard of this little woods and were very glad that the walkers had grouped together to ask for a survey. The survey was asked for prior to some coppicing work that seemed very dodgy, done on the cheap, without knowing what they had in the woods. It was found out, that the Council were working to a budget and didn't think the woods were very important, since the eco survey, little work has been done. They said it was because their budget ran out, but perhaps it was because they were afraid to change the habitat of a wood that seemed much more intricate and interesting than they at first thought. This was all about 10 years ago, and the woods look the same to me, despite the worry by some that it was going to implode if it wasn't heavily coppiced. Christie, thank you so much for the historical background to the gnomes and the information about the woods. How wonderful - although very sad that a local child died.